This book has been written and organized to prepare critically reflective teachers to take their place in society and to do that with the knowledge, personal framework and tools to be successful. The reader will begin with an exploration of the role of higher education—it’s history and development—in influencing society. He will examine how being critically reflective can serve as a fundamental principle to guide our professional journey. She will start drawing the under-painting of a self-portrait of our identities to see what anchors us to our unique qualities that set us apart as individuals and will help inform our professional decisions and life-path. Out of the heightened awareness of our identities and experience we’ll initiate crafting a framework by which we think and are guided in our teaching practice. Readers will engage in exercises to flesh out this framework by unpacking our learning experiences and articulating what was previously implicit: our personal theories of teaching and learning. Readers will experiment with ways in which we become more conscious of how our thinking and feelings inform our actions and how this increased consciousness can guide us in creating powerful and compelling learning experiences for our students. We’ll look at the changing population of diverse higher education students and how we can build community with them by using our sense of identity as a bridge. Readers will learn to revise artifacts from our academic experiences to serve as benchmarks of our professional development and the major skill areas of teaching: preparing to teach, successfully executing our teaching plans in and out of the classroom to encourage deep and lasting learning in our students, effectively assessing their learning as an authentic process and how to document all these efforts throughout our careers for our own development and in preparation for when we are evaluated by others. I look forward to our collaborative journey together. In the 40 years since Dr. David Way has been teaching at Cornell University, he has helped initiate college-wide graduate teaching development programs in four colleges, developed training and educational materials used throughout the university, assisted several colleges to redesign their student evaluation of teaching systems, initiated and published the first university-wide newsletter on undergraduate education, consulted with over 40 departments and academic fields on instructional and faculty development, encompassing nine schools and colleges on the Ithaca campus, and has been instrumental in the design and development of an annual faculty retreat on teaching and learning. 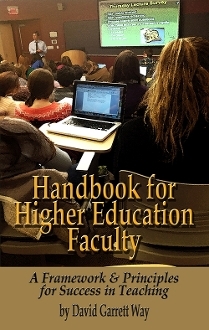 David teaches ALS 6015, The Practice of Teaching in Higher Education and is the author of the Cornell Teaching Evaluation Handbook. He has been involved in the University Self-Study Working Group on Assessment of Student Learning and on the Vice Provost for Undergraduate Education’s Core Assessment Committee. Other previous projects include: Enhancing teaching in research-intensive environments, an international collaboration through Oxford University, UK, and Exploring good leadership and management practice in higher education: issues of engagement, an international collaboration through Cambridge University, UK. David is the Center Liaison to the College of Agriculture and Life Sciences, the Cornell Law School and the College of Veterinary Medicine.